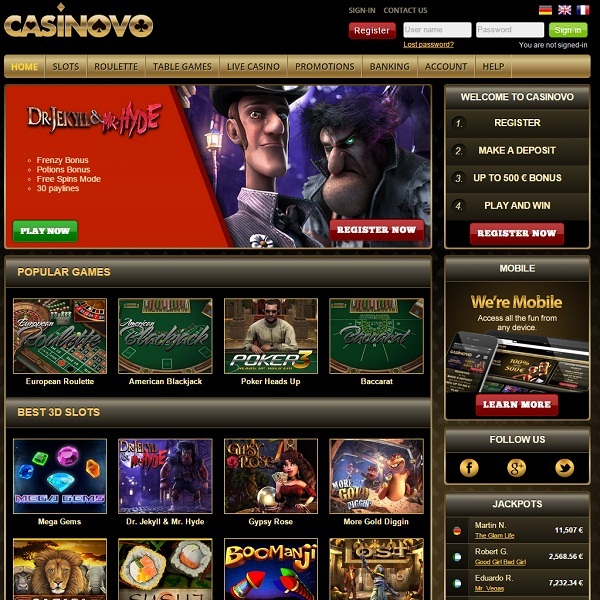 Casinovo is one of the newest online casinos and it is bringing in players with a mixture of high quality games and promotions. New players at the casino can enjoy a 100% first deposit bonus of up to €500. There are then weekly cashback promotions, a range of time limited promotions, a rewarding VIP program and much more. For the high rollers that are some fixed promotions that can’t be missed, such as a €500 bonus every time you deposit €1,000. The casino offers games from BetSoft Gaming, Art of Games and Ezugi. There is a fantastic selection of 3D slots, including some jackpot slots, as well as card and table games and a live casino. Furthermore, a large number of the games can be played from mobile devices so members can play wherever they are.